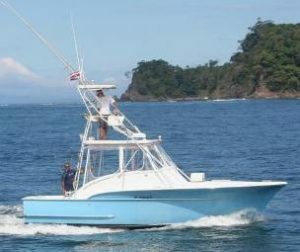 This 31-foot Carolina Custom Express out of Los Sueños Marina in Playa Herradura is powered by a single Cummins 6CTA motor, and cruises at 22 knots. Third-generation American captain Geoffrey Campbell, with almost 20 years experience as a saltwater fishing guide, is at the helm, assisted by English-speaking mates. The boat offers abundant shade, plus a head in the V-berth. It carries a full range of Fin-Nor conventional tackle ranging from 20-50lbs, Sufix IGFA official line from 20lb to 50lb test, and circle hooks provided by Mustad. The usual spread is six dead baits, two teasers and a dredge. There is the latest in electronics including two Furuno GPS, Furuno color sounder, 24-mile radar, two VHF radios, plus all the required USCG safety equipment. Sightseeing excursions to Tortuga Island are also offered. Half days between April 1 and December 1 only.